The latest chart of the International Phonetic Alphabet, revised to 2018. The alphabet has undergone a number of revisions during its history, the most significant being the one put forth at the Kiel Convention in 1989. Changes to the alphabet are proposed and discussed in the Association's organ, Journal of the International Phonetic Association, previously known as Le Maître Phonétique and before that as The Phonetic Teacher, and then put to a vote by the Association's Council. The extensions to the IPA for disordered speech were created in 1990, with its first major revision approved in 2016. The International Phonetic Association was founded in Paris in 1886 under the name Dhi Fonètik Tîtcerz' Asóciécon (The Phonetic Teachers' Association), a development of L'Association phonétique des professeurs d'Anglais ("The English Teachers' Phonetic Association"), to promote an international phonetic alphabet, designed primarily for English, French, and German, for use in schools to facilitate acquiring foreign pronunciation. Originally the symbols had different phonetic values from language to language. For example, English [ʃ] was transcribed with ⟨c⟩ and French [ʃ] with ⟨x⟩. There should be a separate sign for each distinctive sound; that is, for each sound which, being used instead of another, in the same language, can change the meaning of a word. When any sound is found in several languages, the same sign should be used in all. This applies also to very similar shades of sound. The alphabet should consist as much as possible of the ordinary letters of the roman alphabet; as few new letters as possible being used. In assigning values to the roman letters, international usage should decide. The new letters should be suggestive of the sounds they represent, by their resemblance to the old ones. Diacritic marks should be avoided, being trying for the eyes and troublesome to write. The principles would govern all future development of the alphabet, with the exception of #5 and in some cases #2, until they were revised drastically in 1989. #6 has also been loosened, as diacritics have been admitted for limited purposes. The devised alphabet was as follows. The letters marked with an asterisk were "provisional shapes", which were meant to be replaced "when circumstances will allow". ᴜ quer Flem. wrocht, Span. bibir. *a father Ital. mano, Swed. mann. During the 1890s, the alphabet was expanded to cover sounds of Arabic and other non-European languages which did not easily fit the Latin alphabet. Initially, the charts were arranged with laryngeal sounds on the left and labial ones on the right, following the convention of Alexander Melville Bell's Visible Speech. Vowels and consonants were placed in a single chart, reflecting how sounds ranged in openness from stops (top) to open vowels (bottom). The voiced velar fricative was represented by ⟨ ⟩ (distinct from ⟨ɡ⟩, which represents a plosive) since 1895 until it was replaced by ⟨ǥ⟩ in 1900. ⟨ǥ⟩ too would be replaced by ⟨ɣ⟩ in 1931. (θ) is the English hard th, Spanish z, Romaic θ, Icelandic þ; (ð) the English soft th, Icelandic ð, Romaic δ. (ɹ) is the non-rolled r of Southern British, and can also be used for the simple r of Spanish and Portuguese ... (x) is found in German in ach; (ǥ), in wagen, as often pronounced in the north of Germany. (ᴚ) is the Arabic kh as in khalifa; (ʁ) the Danish r; the Parisian r is intermediate between (ʀ) and (ʁ). (ʜ) and (ɦ) are the ha and he in Arabic.—(ᵷ) and (ʒ) are sounds in Circassian. Nasalized vowels were marked with a tilde: ⟨ã⟩, ⟨ẽ⟩, etc. It was noted that ⟨ə⟩ may be used for "any vowel of obscure and intermediate quality found in weak syllables". A long sound was distinguished by trailing ⟨ː⟩. Stress may be marked by ⟨´⟩ before the stressed syllable as necessary. It was noted that in Swedish and Norwegian texts the sign ⟨ˇ⟩ was placed before the stressed syllable of words with "the so-called compound tone". A voiced sound was marked by ⟨◌̬⟩ and a voiceless one by ⟨◌̥⟩. Retroflex consonants were marked by ⟨◌̣⟩, as in ⟨ṣ, ṭ, ṇ⟩. Arabic emphatic consonants were marked by ⟨◌̤⟩: ⟨s̤, t̤, d̤⟩. Consonants accompanied by a glottal stop (ejectives) were marked by ⟨ʼ⟩: ⟨kʼ, pʼ⟩. Tense and lax vowels were distinguished by acute and grave accents: naught [nɔ́ːt], not [nɔ̀t]. Non-syllabic vowels were marked by a breve, as in ⟨ŭ⟩, and syllabic consonants by an acute below, as in ⟨n̗⟩. Following letters, ⟨⊢⟩ stood for advanced tongue, ⟨⊣⟩ for retracted tongue, ⟨˕⟩ for more open, ⟨˔⟩ for more close, ⟨˒⟩ for more rounded, and ⟨˓⟩ for more spread. It was also noted that a superscript letter may be used to indicate a tinge of that sound in the sound represented by the preceding letter, as in ⟨ʃç⟩. [I]t must remain a general principle to leave out everything self-evident, and everything that can be explained once for all. This allows us to dispense almost completely with the modifiers, and with a good many other signs, except in scientific works and in introductory explanations. We write English fill and French fil the same way fil; yet the English vowel is 'wide' and the French 'narrow', and the English l is formed much further back than the French. If we wanted to mark these differences, we should write English fìl⊣, French fíl⊢. But we need not do so: we know, once for all, that English short i is always ì, and French i always í; that English l is always l⊣ and French l always l⊢. In the notes, the half-length symbol ⟨ˑ⟩ was now mentioned. It was noted that whispered sounds may be marked with a diacritical comma, as in ⟨u̦, i̦⟩. A syllabic consonant was now marked by a vertical bar, as in ⟨n̩⟩, rather than ⟨n̗⟩. It was noted, only in this edition, that "shifted vowels" may be indicated: ⟨⊣⊣⟩ for in-mixed or in-front, and ⟨⊢⊢⟩ for out-back. ⟨ř⟩, for the Czech fricative trill, and ⟨ɛ̈⟩, replacing ⟨ä⟩, were added, following their approval in 1909. Though not included in the chart, ⟨ɱ⟩ was mentioned as an optional symbol for the labiodental nasal. ⟨ɹ⟩ was still designated as the "provisional" symbol for the alveolar tap/flap. ⟨σ, ƍ⟩ were defined as the Bantu sounds with "tongue position of θ, ð, combined with strong lip-rounding". ⟨ʜ, Q⟩ were still included though not in the chart. ⟨ᴙ⟩ was removed entirely. For the first time, affricates, or "'[a]ssibilated' consonant groups, i. e. groups in which the two elements are so closely connected that the whole might be treated as a single sound", were noted as able to be represented with a tie bar, as in ⟨t͡ʃ, d͜z⟩. Palatalized consonants could be marked by a dot above the letter, as in ⟨ṡ, ṅ, ṙ⟩, "suggesting the connexion with the sounds i and j". ⟨⊢, ⊣⟩ were no longer mentioned. ⟨χ⟩ replaced ⟨ᴚ⟩ and ⟨ɤ⟩ replaced ⟨Ɐ⟩, both of which would not officially be approved until 1928. ⟨ƕ⟩ replaced ⟨ʍ⟩ and ⟨ ⟩ was added for a devoiced [ɥ], but neither has appeared in any other IPA chart. Also added were central vowels ⟨ɨ, ʉ, ɘ, ɵ, ɜ, ʚ⟩, which also appeared in Trofimov & Jones (1923), p. 40, and in the chart in Le Maître Phonétique from 1926 to 1927, though without the Council's approval. Of these, only ⟨ɨ, ʉ, ɜ, ɵ⟩ were approved in the 1928 revision, with a different value for ⟨ɜ⟩, until ⟨ɘ, ʚ⟩ were revived and ⟨ɜ⟩ regained the 1921 value in 1993. ⟨ħ, ʕ⟩ for the Arabic ح and ع, "whose formation we do not yet agree on"
⟨ɕ, ʑ⟩ for "dentalized palatals"
It recommended the use of a circumflex for the Swedish grave accent, as in [ˆandən] ("the spirit"). It was mentioned that some authors prefer ⟨˖, ˗⟩ in place of ⟨⊢, ⊣⟩. Aspiration was marked as ⟨pʻ, tʻ, kʻ⟩ and stronger aspiration as ⟨ph, th, kh⟩. Paul Passy recognized the need for symbols for the various clicks in the July–August 1914 number of Le Maître Phonétique and asked for suggestions. This number, however, was the last for some years because of the war. During this interval, Professor Daniel Jones himself invented the four symbols, in consultation with Paul Passy and they were all four printed in the pamphlet L'Écriture Phonétique Internationale published in 1921. The symbols were thus introduced in a somewhat unusual way, without the explicit consent of the whole Council of the Association. They were, however, generally accepted from then on, and, as you say, were used by Professor Doke in 1923. I have consulted Professor Jones in this matter, and he accepts responsibility for their invention, during the period of the First World War. ⟨ʇ, ʖ, ʗ⟩ were later approved by the Council in 1928. ⟨ʞ⟩ would be included in all subsequent booklets, but not in the single-page charts. It is considered to have been withdrawn by 1979 because the production of a velar click was deemed impossible. The symbol was repurposed by the extensions to the IPA to denote a velodorsal stop in 2004, but this usage was withdrawn in 2016 because back-released velar clicks were reported to occur in some languages. The 1921 book was the first in the series to mention the word phoneme (phonème). ⟨ɺ⟩ for a sound "intermediate between l and d in African languages"
In the same year, ⟨ɒ⟩ for the rounded variety of [ɑ] and ⟨ɤ⟩, replacing ⟨Ɐ⟩, were also approved. Jones (1928) also included ⟨ɱ⟩ for a labiodental nasal, ⟨ɾ⟩ for a dental or alveolar tap, ⟨ʞ⟩ for a velar click, and the tonal notation system seen in Association phonétique internationale (1921), p. 9. For the Swedish and Norwegian compound tones he recommended "any arbitrarily chosen mark", with the illustration [˟andən] ("the spirit"). He used ⟨ᴜ⟩ in place of ⟨ʊ⟩. Apart from ⟨ᴜ⟩ and ⟨ʞ⟩, these new specifications would be inherited in the subsequent charts and booklets. The diacritic for whispered ⟨◌̦⟩ or those for tense and lax ⟨◌́, ◌̀⟩ were no longer mentioned. An updated chart appeared as a supplement to Le Maître Phonétique in 1932. The vowels were now arranged in a right-angled trapezium as opposed to an isosceles trapezium, reflecting Daniel Jones' development of the Cardinal Vowel theory. A practically identical chart—with the exception of ⟨ɣ⟩—in German had appeared in Jones (1928), p. 23. The substitution of ⟨ɣ⟩ for ⟨ǥ⟩ was approved in 1931. Other Sounds.—Palatalized consonants: ƫ, ᶁ, etc. Velarized or pharyngealized consonants: ɫ, ᵭ, ᵴ, etc. Ejective consonants (plosives [sic] with simultaneous glottal stop): pʼ, tʼ, etc. Implosive voiced consonants: ɓ, ɗ, etc. ř fricative trill. σ, ƍ (labialized θ, ð, or s, z). ƪ, ƺ (labialized ʃ, ʒ). ʇ, ʗ, ʖ (clicks, Zulu c, q, x). ɺ (a sound between r and l). ʍ (voiceless w). ɪ, ʏ, ʊ (lowered varieties of i, y, u). ɜ (a variety of ə). ɵ (a vowel between ø and o). Affricates are normally represented by groups of two consonants (ts, tʃ, dʒ, etc. ), but, when necessary, ligatures are used (ʦ, ʧ, ʤ, etc. ), or the marks ͡ or ͜ (t͡s or t͜s, etc.). c, ɟ may occasionally be used in place of tʃ, dʒ. Aspirated plosives: ph, th, etc. Length, Stress, Pitch.— ː (full length). ˑ (half length). ˈ (stress, placed at the beginning of the stressed syllable). ˌ (secondary stress). ˉ (high level pitch); ˍ (low level); ˊ (high rising); ˏ (low rising); ˋ (high falling); ˎ (low falling); ˆ (rise-fall); ˇ (fall-rise). See Écriture Phonétique Internationale, p. 9. Modifiers.— ˜ nasality. ˳ breath (l̥ = breathed l). ˬ voice (s̬ = z). ʻ slight aspiration following p, t, etc. ̣ specially close vowel (ẹ = a very close e). ˛ specially open vowel (ę = a rather open e). ̫ labialization (n̫ = labialized n). ̪ dental articulation (t̪ = dental t). ˙ palatalization (ż = ᶎ). ˔ tongue slightly raised. ˕ tongue slightly lowered. ˒ lips more rounded. ˓ lips more spread. Central vowels ï (= ɨ), ü (= ʉ), ë (= ə˔), ö (= ɵ), ɛ̈, ɔ̈. ˌ (e.g. n̩) syllabic consonant. ˘ consonantal vowel. ʃˢ variety of ʃ resembling s, etc. A new chart appeared in 1938, with a few modifications. ⟨ɮ⟩ was replaced by ⟨ꜧ⟩, which was approved earlier in the year with the compromise ⟨ ⟩ also acknowledged as an alternative. The use of tie bars ⟨◌͡◌, ◌͜◌⟩ was allowed for synchronous articulation in addition to affricates, as in ⟨m͡ŋ⟩ for simultaneous [m] and [ŋ], which was approved in 1937. In the notes, the reference to Association phonétique internationale (1921), p. 9, in regard to tonal notation was removed. R-coloured vowels: ⟨eɹ⟩, ⟨aɹ⟩, ⟨ɔɹ⟩, etc., ⟨eʴ⟩, ⟨aʴ⟩, ⟨ɔʴ⟩, etc., or ⟨ᶒ⟩, ⟨ᶏ⟩, ⟨ᶗ⟩, etc. The word "plosives" in the description of ejectives and the qualifier "slightly" in the definitions of ⟨˔, ˕⟩ were removed. ⟨eh⟩, ⟨ah⟩, etc. or ⟨e̒⟩, ⟨a̒⟩, etc. for "vowels pronounced with 'breathy voice' (h-coloured vowels)"
None of these specifications were inherited in the subsequent charts. ⟨ˌ⟩ was defined as an indicator of "medium stress". In 1948, ⟨ɡ⟩ and ⟨ ⟩ were approved as typographic alternatives, while it was also acknowledged that ⟨ ⟩ may be used for a velar plosive and ⟨ɡ⟩ for an advanced one in narrow transcription of a language where it is preferable to distinguish the two, such as Russian. The 1949 Principles recommended this alternation of the symbols but did not mention their typographic equivalency in other languages. Nevertheless, the recommendation was hardly adopted, not even by Jones & Ward (1969), who used ⟨ɡ⟩ and ⟨ᶃ⟩. The 1951 chart added ⟨ɚ⟩ as yet another alternative to an r-coloured [ə], following its approval in 1950. Conceived by John S. Kenyon, the symbol was in itself a combination of ⟨ə⟩ and the hook for retroflex consonants approved by the IPA in 1927. Since its introduction in 1935, the symbol was widely adopted by American linguists and the IPA had been asked to recognize it as part of the alphabet. ʦ ʧ ʤ: t͡s t͡ʃ d͡ʒ. ⟨ɻ⟩ for a retroflex approximant was approved in 1973. On the same occasion, ⟨š⟩, ⟨ž⟩, ⟨č⟩, and ⟨ǰ⟩ or ⟨ǧ⟩ as alternatives for [ʃ, ʒ, tʃ, dʒ] were proposed but the votes were inconclusive. Diacritics ⟨◌̢⟩ (subscript, not attached) for retroflexion, ⟨◌̮⟩ for palatalization, and ⟨◌̯⟩ for indicating non-fricative continuant were proposed but rejected. ⟨◌̈⟩ representing "centralized" rather than "central"
On the other hand, ⟨ɘ⟩ for the close-mid central unrounded vowel, ⟨ɞ⟩ for the open-mid central rounded vowel, and ⟨ᴀ⟩ for the open central unrounded vowel were proposed but rejected. The proposal of ⟨ɘ, ɞ⟩ was based on Abercrombie (1967), p. 161. ⟨ʝ⟩ for the voiced palatal fricative and ⟨◌̰⟩ for creaky voice were proposed but the votes were inconclusive. In the 1979 chart, ⟨ɩ, ʏ, ɷ⟩, previously defined as "lowered varieties of i, y, u", appeared slightly centered rather than simply midway between [i, y, u] and [e, ø, o] as they did in the 1912 chart. ⟨ɪ, ʊ⟩, the predecessors to ⟨ɩ, ɷ⟩, were acknowledged as alternatives to ⟨ɩ, ɷ⟩ under the section "Other symbols". ⟨ɵ⟩ appeared as the rounded counterpart to [ə] rather than between [ø] and [o]. The name of the column "Dental and alveolar" was changed to "Dental, alveolar, or post-alveolar". "Pharyngeal", "trill", "tap or flap", and "approximant" replaced "pharyngal", "rolled", "flapped", and "frictionless continuants", respectively. ⟨ɹ, ʁ⟩, which were listed twice in both the fricative and frictionless continuant rows in the previous charts, now appeared as an approximant and a fricative, respectively, while the line between the rows was erased, indicating certain fricative symbols may represent approximants and vice versa, with the employment of the raised and lowered diacritics if necessary. ⟨ʍ⟩, previously defined as "voiceless w", was specified as a fricative. ⟨j⟩ remained listed twice in the fricative and approximant rows. ⟨ɺ⟩, previously defined merely as "a sound between r and l", was redefined as an alveolar lateral flap. By the 1980s, phonetic theories had developed so much since the inception of the alphabet that the framework of it had become outdated. To resolve this, at the initiative of IPA President Peter Ladefoged, approximately 120 members of the IPA gathered at a convention held in Kiel, West Germany, in August 1989, to discuss revisions of both the alphabet and the principles it is founded upon. It was at this convention that it was decided that the Handbook of the IPA (International Phonetic Association 1999) be written and published to supersede the 1949 Principles. In addition to the revisions of the alphabet, two workgroups were set up, one on computer coding of IPA symbols and computer representation of individual languages, and the other on pathological speech and voice quality. The former group concluded that each IPA symbol should be assigned a three-digit number for computer coding known as IPA Number, which was published in International Phonetic Association (1999), pp. 161–185. The latter devised a set of recommendations for the transcription of disordered speech based on the IPA known as the Extensions to the International Phonetic Alphabet or extIPA, which was published in 1990 and adopted by the International Clinical Phonetics and Linguistics Association, which now maintains it, in 1994. Tone, which had been indicated with an iconic line preceding the syllable or above or below the vowel, was now written one of two ways: with a similar iconic line following the syllable and anchored to a vertical bar, as in ⟨˥, ˦, ˧˩˨⟩ (Chao's tone letters), or with more abstract diacritics written over the vowel (acute = high, macron = mid, grave = low), which could be compounded with each other, as in ⟨ə᷄, ə᷆, ə᷈, ə̋, ə̏⟩. The palato-alveolar column was removed and ⟨ʃ, ʒ⟩ were listed alongside the postalveolars. ⟨ɹ⟩ appeared at the same horizontal position as the other alveolars rather than slightly more back as did in the previous charts. ⟨ʀ⟩ was specified as a trill rather than either a trill or flap. The alternative raised and lowered diacritics ⟨◌̣, ◌̨⟩ were eliminated in favour of ⟨◌̝, ◌̞⟩, which could now be attached to consonants to denote fricative or approximant, as in ⟨ɹ̝, β̞⟩. Diacritics for relative articulation placed next to, rather than below, a letter, namely ⟨◌˖, ◌˗, ◌I, ◌˔, ◌˕⟩, were no longer mentioned. The diacritic for no audible release ⟨◌̚⟩ was finally mentioned in the chart. ⟨ɩ, ɷ⟩ were eliminated in favour of ⟨ɪ, ʊ⟩. The symbol for the close-mid back unrounded vowel was revised from ⟨ ⟩ ("baby gamma"), with a flat top, to ⟨ ⟩ ("ram's horns"), with a rounded top, to better distinguish it from ⟨ɣ⟩, which represents a voiced velar fricative. ⟨ɮ⟩ was revived in place of ⟨ ⟩. ⟨ɚ⟩ was no longer mentioned, and instead a right-hook diacritic ⟨˞⟩ was added for rhoticity (not attached to the letter, as in ⟨ə ˞⟩, unlike ⟨ɚ⟩); the superscript rhotic diacritics were no longer mentioned. ⟨ʆ, ʓ⟩ for palatalized [ʃ, ʒ] and ⟨ɼ⟩ for the alveolar fricative trill were withdrawn (now written ⟨ʃʲ, ʒʲ⟩ and ⟨r̝⟩). The affricate ligatures were withdrawn. The tie bar below symbols for affricates and doubly articulated consonants, as in ⟨t͜s⟩, was no longer mentioned. The practice of placing a superscript symbol to indicate the resemblance to a sound, previously illustrated by ⟨ʃˢ⟩, was no longer explicitly recommended. At the convention, proposals such as ⟨ ⟩ for a voiced labial–velar fricative, ⟨ ⟩ for a voiceless velar lateral fricative, ⟨ɮ⟩ for a voiced velar lateral fricative, ⟨ ⟩ for a voiceless palatal lateral fricative, ⟨ŝ, ẑ⟩ for "the 'hissing-hussing' fricatives of some Caucasian languages", and ⟨ᴀ⟩ for an open central unrounded vowel were discussed but dismissed. The six principles set out in 1888 were replaced by a much longer text consisting of seven paragraphs. The first two paragraphs established the alphabet's purpose, namely to be "a set of symbols for representing all the possible sounds of the world's languages" and "representing fine distinctions of sound quality, making the IPA well suited for use in all disciplines in which the representation of speech sounds is required". The second paragraph also said, "[p] is a shorthand way of designating the intersection of the categories voiceless, bilabial, and plosive; [m] is the intersection of the categories voiced, bilabial, and nasal; and so on", refining the previous, less clearly defined principle #2 with the application of the distinctive feature theory. Discouragement of diacritics was relaxed, though recommending their use be limited to cases: "(i) For denoting length, stress and pitch. (ii) For representing minute shades of sounds. (iii) When the introduction of a single, diacritic obviates the necessity for designing a number of new symbols (as, for instance, in the representation of nasalized vowels)". The principles also adopted the recommendation of enclosing phonetic transcriptions in square brackets [ ] and phonemic ones in slashes / /, a practice that emerged in the 1940s. The principles were reprinted in the 1999 Handbook. The 2005 chart. There are only minor changes from 1993. ⟨ƥ, ƭ, ƈ, ƙ, ʠ⟩ for the voiceless implosives were withdrawn. The non-pulmonic consonants (ejectives and implosives) were removed from the main table and set up with the clicks in a separate section, with ⟨ʼ⟩ acknowledged as an independent modifier for ejective (therefore allowing combinations absent in the chart). It was noted that subdiacritics may be moved above a letter to avoid interference with a descender. The alternative symbol for the mid central vowel ⟨ɜ⟩ was redefined as open-mid, and the one for the mid central rounded vowel ⟨ɵ⟩ as close-mid rounded. Two new vowel letters, ⟨ɘ⟩ and ⟨ʚ⟩, were added, representing close-mid unrounded and open-mid rounded, respectively. The right half of the cell for pharyngeal plosives was shaded, indicating the impossibility of a voiced pharyngeal plosive. On the same occasion, it was reaffirmed that ⟨ɡ⟩ and ⟨ ⟩ are typographic alternatives. The revised chart was now portrait-oriented. ⟨ə⟩ and ⟨ɐ⟩ were moved to the centerline of the vowel chart, indicating that they are not necessarily unrounded. The word "voiced" was removed from the definition for ⟨ʡ⟩, now simply "epiglottal plosive". "Other symbols" and diacritics were slightly rearranged. In 1996, it was announced that the symbol for the open-mid central rounded vowel in the 1993 chart, ⟨ʚ⟩, was a typographical error and should be changed to ⟨ɞ⟩, stating the latter was the symbol which "J. C. Catford had in mind when he proposed the central vowel changes ... in 1990", also citing Abercrombie (1967) and Catford (1977), who had ⟨ɞ⟩. However, the symbol Catford proposed for the value in 1990 was in fact ⟨ꞓ⟩ (a barred ⟨ɔ⟩), with an alternative being ⟨ʚ⟩, but not ⟨ɞ⟩. Errata for Catford (1990) appeared in 1992, but the printed symbol was again ⟨ʚ⟩ and the errata even acknowledged that ⟨ʚ⟩ was included in Association phonétique internationale (1921), pp. 6–7, pointed out by David Abercrombie. In the updated chart, the subsections were rearranged so that the left edge of the vowel chart appeared right beneath the palatal column, hinting at the palatal place of articulation for [i, y], as did in all pre-1989 charts, though the space did not allow the back vowels to appear beneath the velars. A tie bar placed below symbols, as in ⟨t͜s⟩, was mentioned again. ⟨˞⟩ was now attached to the preceding letter, as in ⟨ə˞⟩. A few illustrations in the chart were changed: ⟨a˞⟩ was added for rhoticity, and ⟨i̠, ɹ̩⟩ were replaced with ⟨e̠, n̩⟩. The word "etc." was dropped from the list of tones. The 1999 Handbook of the International Phonetic Association was the first book outlining the specifications of the alphabet in 50 years, superseding the 1949 Principles of the IPA. It consisted of just over 200 pages, four times as long as the Principles. In addition to what was seen in the 1996 chart, which was reprinted in the front matter, the book included ⟨ᵊ⟩ for mid central vowel release, ⟨ᶿ⟩ for voiceless dental fricative release, and ⟨ˣ⟩ for voiceless velar fricative release as part of the official IPA in the "Computer coding of IPA symbols" section. It also said ⟨ᶹ⟩ "might be used" for "a secondary reduction of the lip opening accompanied by neither protrusion nor velar constriction". It abandoned the 1949 Principles' recommendation of alternating ⟨ ⟩ and ⟨ɡ⟩ for ordinary and advanced velar plosives, and acknowledged both shapes as acceptable variants. In 2005, ⟨ⱱ⟩ was added for the labiodental flap. In 2011, it was proposed that ⟨ᴀ⟩ be added to represent the open central unrounded vowel, but this was declined by the Council the following year. In 2012, the IPA chart and its subparts were released under the Creative Commons Attribution-ShareAlike 3.0 Unported License. 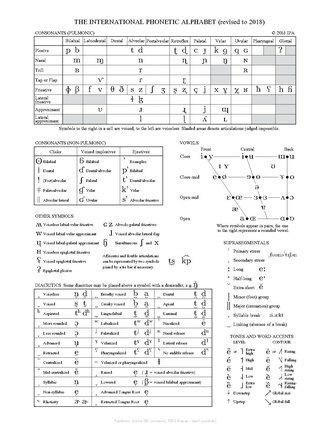 In 2016, three versions of a revised chart dated 2015 were released online, each with the phonetic symbols rendered in a different typeface (IPA Kiel/LS Uni developed by Linguist's Software, Doulos SIL, and DejaVu Sans). No symbols were added or withdrawn, but some notes and the shapes of a few symbols were slightly modified. In particular, ⟨ə˞⟩ was replaced by ⟨ɚ⟩, with a continuous, slanted stroke. In 2018, another slightly modified chart in different fonts was released, this time also in TeX TIPA Roman developed by Rei Fukui, which was selected as best representing the IPA symbol set by the Association's Alphabet, Charts and Fonts committee, established the previous year. ^ ⟨œ⟩ for English is omitted in the key but nonetheless seen in transcriptions in the May 1887 article. ^ a b c d To be precise, the shape of ⟨ǥ⟩ is close to ⟨ ⟩ in the 1900, 1904, and 1912 charts, and to ⟨ ⟩ in the 1921 chart. ^ a b c The small capital Q ⟨ꞯ⟩ was adopted for a voiceless upper pharyngeal stop by the extensions to the IPA in 2016. ^ The obsolete lowered diacritic is shown, or identified, as the left half ring ⟨◌̜⟩, now standing for less rounded, by some, and as the ogonek ⟨◌̨⟩ by others. ^ Ball, Howard & Miller (2018). ^ International Phonetic Association (1999), pp. 194–7. ^ a b International Phonetic Association (1999), p. 196. ^ Phonetic Teachers' Association (1887a). ^ Phonetic Teachers' Association (1887b). ^ Phonetic Teachers' Association (1888a). ^ a b Phonetic Teachers' Association (1888b). ^ International Phonetic Association (1949), back endpaper. ^ a b c d International Phonetic Association (1989a). ^ Kemp (2006), p. 407. ^ MacMahon (1986), pp. 35, 38 n. 20. ^ Association phonétique internationale (1900b), p. 7. ^ Esling (2010), p. 681. ^ Association phonétique internationale (1895). ^ Association phonétique internationale (1900a). ^ a b Association phonétique internationale (1931). ^ a b c Association phonétique internationale (1900b), p. 8. ^ a b Association phonétique internationale (1900b), p. 9. ^ a b Association phonétique internationale (1904), p. 10. ^ Association phonétique internationale (1904), p. 7. ^ Heselwood (2013), pp. 112–3. ^ Association phonétique internationale (1904), p. 8. ^ Ball, Howard & Miller (2018), pp. 160–1. ^ Association phonétique internationale (1904), p. 9. ^ Association phonétique internationale (1904), p. 9, citing Sweet (1902), p. 37. ^ Association phonétique internationale (1905). ^ Association phonétique internationale (1908). ^ Association phonétique internationale (1912), p. 10. ^ Association phonétique internationale (1912), p. 12. ^ Association phonétique internationale (1912), p. 13. ^ Association phonétique internationale (1921), p. 6. ^ a b c Association phonétique internationale (1928). ^ Esling (2010), pp. 681–2. ^ a b c Wells (1975). ^ Association phonétique internationale (1921), pp. 8–9. ^ a b Association phonétique internationale (1921), p. 9. ^ a b Association phonétique internationale (1921), p. 10. ^ Breckwoldt (1972), p. 285. ^ Jones (1928), p. 26. ^ Jones & Camilli (1933), p. 11. ^ Jones & Dahl (1944), p. 12. ^ a b International Phonetic Association (1949), p. 14. ^ Ball, Howard & Miller (2018), pp. 159, 161. ^ Jespersen & Pedersen (1926). ^ a b Collins & Mees (1998), p. 315. ^ Association phonétique internationale (1927). ^ Jones (1928), pp. 23, 25–7. ^ a b Association phonétique internationale (1932). ^ a b Jones (1938). ^ Association phonétique internationale (1937). ^ Association phonétique internationale (1938). ^ Association phonétique internationale (1947). ^ International Phonetic Association (1999), p. vii. ^ International Phonetic Association (1949), pp. 15–9. ^ International Phonetic Association (1949), p. 18. ^ Jones & Ward (1969), p. 115. ^ Association phonétique internationale (1952). ^ Kenyon (1951), pp. 315–7. ^ Editors of American Speech (1939). ^ International Phonetic Association (1978). ^ a b c d Wells (1976). ^ McClure (1972), p. 20. ^ Ladefoged & Roach (1986). ^ International Phonetic Association (1989a), p. 69. ^ International Phonetic Association (1999), pp. 165, 185. ^ International Phonetic Association (1999), p. 186. ^ International Phonetic Association (1989b). ^ Köhler et al. (1988). ^ International Phonetic Association (1989a), pp. 72, 74. ^ International Phonetic Association (1989a), p. 67. ^ a b c International Phonetic Association (1989a), p. 68. ^ International Phonetic Association (1999), pp. 37–8. ^ Heitner (2003), p. 326 n. 6. ^ International Phonetic Association (1999), pp. 159–60. ^ a b International Phonetic Association (1993a). ^ International Phonetic Association (1993b). ^ Abercrombie (1967), p. 161. ^ Catford (1977), pp. 178–9. ^ International Phonetic Association (1991). ^ Esling (2010), p. 697. ^ a b International Phonetic Association (1999), p. ix. ^ International Phonetic Association (1999), pp. 167, 170–1, 179. ^ International Phonetic Association (1999), p. 17. ^ International Phonetic Association (1999), p. 19. ^ International Phonetic Association (2012). ^ a b International Phonetic Association (2016). ^ International Phonetic Association (2018). ^ Whitley (2003), p. 84 n. 2. Abercrombie, David (1967). Elements of General Phonetics. Edinburgh University Press. Albright, Robert W. (1958). "The International Phonetic Alphabet: Its backgrounds and development". International Journal of American Linguistics. 24 (1). Part III. Association phonétique internationale (1895). "vɔt syr l alfabɛ" [Votes sur l'alphabet]. Le Maître Phonétique. 10 (1): 16–17. JSTOR 44707535. Association phonétique internationale (1900a). "akt ɔfisjɛl" [Acte officiel]. Le Maître Phonétique. 15 (2–3): 20. JSTOR 44701257. Association phonétique internationale (1900b). "Exposé des principes de l'Association phonétique internationale". Le Maître Phonétique. 15 (11). Supplement. JSTOR 44749210. Association phonétique internationale (1904). "Aim and Principles of the International Phonetic Association". Le Maître Phonétique. 19 (11). Supplement. JSTOR 44703664. Association phonétique internationale (1905). "Exposé des principes de l'Association phonétique internationale". Le Maître Phonétique. 20 (6–7). Supplement. JSTOR 44707887. Association phonétique internationale (1908). "Exposé des principes de l'Association phonétique internationale". 23 (9–10). Supplement. JSTOR 44707916. Association phonétique internationale (1912). "The Principles of the International Phonetic Association". Le Maître Phonétique. 27 (9–10). Supplement. JSTOR 44707964. Association phonétique internationale (1921). L'Ecriture phonétique internationale : exposé populaire avec application au français et à plusieurs autres langues (2nd ed.). Association phonétique internationale (1927). "desizjɔ̃ dy kɔ̃sɛːj rəlativmɑ̃ o prɔpozisjɔ̃ d la kɔ̃ferɑ̃ːs də *kɔpnag" [Décisions du conseil relativement aux propositions de la conférence de Copenhague]. Le Maître Phonétique. Troisième série. 5 (18): 13–18. JSTOR 44704201. Association phonétique internationale (1928). "desizjɔ̃ ofisjɛl" [Décisions officielles]. Le Maître Phonétique. Troisième série. 6 (23): 51–53. JSTOR 44704266. Association phonétique internationale (1931). "desizjɔ̃ ofisjɛl" [Décisions officielles]. Le Maître Phonétique. Troisième série. 9 (35): 40–42. JSTOR 44704452. Association phonétique internationale (1932). "The International Phonetic Alphabet (revised to 1932)". Le Maître Phonétique. Troisième série. 10 (37). Supplement. JSTOR 44749172. Reprinted in MacMahon (1996), p. 830. Association phonétique internationale (1937). "desizjɔ̃ ofisjɛl" [Décisions officielles]. Le Maître Phonétique. Troisième série. 15 (52): 56–57. JSTOR 44704932. Association phonétique internationale (1938). "The International Phonetic Alphabet (revised to 1938)". Le Maître Phonétique. Troisième série. 16 (62). Supplement. JSTOR 44748188. Association phonétique internationale (1947). "The International Phonetic Alphabet (revised to 1947)". Le Maître Phonétique. Troisième série. 25 (88). Supplement. JSTOR 44748304. Reprinted in Albright (1958), p. 57. Association phonétique internationale (1952). "The International Phonetic Alphabet (revised to 1951)". Le Maître Phonétique. Troisième série. 30 (97). Front matter. JSTOR 44748475. Reprinted in MacMahon (2010), p. 270. Ball, Martin J.; Howard, Sara J.; Miller, Kirk (2018). "Revisions to the extIPA chart". Journal of the International Phonetic Association. 48 (2): 155–164. doi:10.1017/S0025100317000147. Breckwoldt, G. H. (1972). "A Critical Investigation of Click Symbolism". In Rigault, André; Charbonneau, René (eds.). Proceedings of the Seventh International Congress of Phonetic Sciences. The Hague and Paris: Mouton. pp. 281–293. doi:10.1515/9783110814750-017. Catford, J. C. (1977). Fundamental Problems in Phonetics. Edinburgh University Press. ISBN 0-85224-279-4. Catford, J. C. (1990). "A proposal concerning central vowels". Journal of the International Phonetic Association. 20 (2): 26–28. doi:10.1017/S0025100300004230. Collins, Beverly; Mees, Inger M. (1998). The Real Professor Higgins: The Life and Career of Daniel Jones. Berlin: Mouton de Gruyter. ISBN 3-11-015124-3. Collins, Beverly; Mees, Inger M., eds. (2003). Daniel Jones: Selected Works. Volume VII: Selected Papers. London: Routledge. ISBN 0-415-23343-7. Esling, John H. (1995). "News of the IPA". Journal of the International Phonetic Association. 25 (1): 48. doi:10.1017/S0025100300000207. Gimson, A. C. (1950). "desizjɔ̃ ofisjɛl" [Décisions officielles]. Le Maître Phonétique. Troisième série. 28 (94): 40–41. JSTOR 44705333. Gimson, A. C. (1973). "The Association's Alphabet". Journal of the International Phonetic Association. 3 (2): 60–61. doi:10.1017/S0025100300000773. Heselwood, Barry (2013). Phonetic Transcription in Theory and Practice. Edinburgh University Press. ISBN 978-0-7486-4073-7. Heitner, Reese M. (2003). "Brackets and slashes, stars and dots: understanding the notation of linguistic types". Language Sciences. 25 (4): 319–330. doi:10.1016/S0388-0001(03)00003-2.
International Phonetic Association (1949). "The Principles of the International Phonetic Association". Le Maître Phonétique. Troisième série. 27 (91). Supplement. JSTOR i40200179. Reprinted in Journal of the International Phonetic Association 40 (3), December 2010, pp. 299–358, doi:10.1017/S0025100311000089. International Phonetic Association (1978). "The International Phonetic Alphabet (Revised to 1979)". Journal of the International Phonetic Association. 8 (1–2). Supplement. JSTOR 44541414. Reprinted in MacMahon (2010), p. 271.
International Phonetic Association (1989a). "Report on the 1989 Kiel Convention". Journal of the International Phonetic Association. 19 (2): 67–80. doi:10.1017/S0025100300003868. JSTOR 44526032.
International Phonetic Association (1989b). "The International Phonetic Alphabet (revised to 1989)". Journal of the International Phonetic Association. 19 (2). Centerfold. doi:10.1017/S002510030000387X. International Phonetic Association (1991). "Errata". Journal of the International Phonetic Association. 21 (1). Front matter. doi:10.1017/S0025100300005910. International Phonetic Association (1993a). "Council actions on revisions of the IPA". Journal of the International Phonetic Association. 23 (1): 32–34. doi:10.1017/S002510030000476X. International Phonetic Association (1993b). "The International Phonetic Alphabet (revised to 1993)". Journal of the International Phonetic Association. 23 (1). Center pages. doi:10.1017/S0025100300004746. Reprinted in MacMahon (1996), p. 822.
International Phonetic Association (1999). Handbook of the International Phonetic Association: A Guide to the Use of the International Phonetic Alphabet. Cambridge University Press. ISBN 0-521-63751-1.
International Phonetic Association (1 July 2012). "IPA Chart now under a Creative Commons Licence". International Phonetic Association (2016). "Full IPA Chart". Archived from the original on 5 March 2016.
International Phonetic Association (2018). "IPA charts and sub-charts in four fonts". Jespersen, Otto; Pedersen, Holger (1926). Phonetic Transcription and Transliteration: Proposals of the Copenhagen Conference, April 1925. Oxford University Press. Jones, Daniel (1928). "Das System der Association Phonétique Internationale (Weltlautschriftverein)". In Heepe, Martin (ed.). Lautzeichen und ihre Anwendung in verschiedenen Sprachgebieten. Berlin: Reichsdruckerei. pp. 18–27. Reprinted in Le Maître Phonétique 3, 6 (23), July–September 1928, JSTOR 44704262. Reprinted in Collins & Mees (2003). Jones, Daniel (1938). "desizjɔ̃ ofisjɛl" [Décisions officielles]. Le Maître Phonétique. Troisième série. 16 (61): 14–15. JSTOR 44704878. Jones, Daniel (1943). "desizjɔ̃ ofisjɛl" [Décisions officielles]. Le Maître Phonétique. Troisième série. 21 (80): 27–28. JSTOR 44705153. Jones, Daniel (1945). "desizjɔ̃ ofisjɛl" [Décisions officielles]. Le Maître Phonétique. Troisième série. 23 (83): 11–17. JSTOR 44705184. Jones, Daniel (1948). "desizjɔ̃ ofisjɛl" [Décisions officielles]. Le Maître Phonétique. Troisième série. 26 (90): 28–31. JSTOR 44705217. Jones, Daniel; Camilli, Amerindo (1933). "Fondamenti di grafia fonetica secondo il sistema dell'Associazione fonetica internazionale". Le Maître Phonétique. Troisième série. 11 (43). Supplement. JSTOR 44704558. Reprinted in Collins & Mees (2003). Jones, Daniel; Dahl, Ivar (1944). "Fundamentos de escritura fonética según el sistema de la Asociación Fonética Internacional". Le Maître Phonétique. Troisième série. 22 (82). Supplement. Reprinted in Collins & Mees (2003). Keating, Patricia (2012). "IPA Council votes against new IPA symbol". Journal of the International Phonetic Association. 42 (2): 245. doi:10.1017/S0025100312000114. Keating, Patricia (14 June 2017). "IPA Council establishes new committees". International Phonetic Association. Keating, Patricia (18 May 2018). "2018 IPA charts now posted online". International Phonetic Association. Kemp, A. (2006). "Phonetic Transcription: History". In Brown, Keith (ed.). Encyclopedia of Language and Linguistics. 9 (2nd ed.). Amsterdam: Elsevier. pp. 396–410. doi:10.1016/B0-08-044854-2/00015-8. ISBN 978-0-08-044854-1. Kelly, John (1981). "The 1847 Alphabet: an Episode of Phonotypy". In Asher, R. E.; Henderson, Eugene J. A. (eds.). Towards a History of Phonetics. Edinburgh University Press. pp. 248–264. ISBN 0-85224-374-X. Kenyon, John S. (1951). "Need of a uniform phonetic alphabet". Quarterly Journal of Speech. 37 (3): 311–320. doi:10.1080/00335635109381671. Köhler, Oswin; Ladefoged, Peter; Snyman, Jan; Traill, Anthony; Vossen, Rainer (1988). "The symbols for clicks". Journal of the International Phonetic Association. 18 (2): 140–142. doi:10.1017/S0025100300003741. Ladefoged, Peter (1987a). "Updating the Theory". Journal of the International Phonetic Association. 17 (1): 10–14. doi:10.1017/S0025100300003170. Ladefoged, Peter (1987b). "Proposed revision of the International Phonetic Alphabet: A conference". Journal of the International Phonetic Association. 17 (1): 34. doi:10.1017/S0025100300003224. Ladefoged, Peter; Roach, Peter (1986). "Revising the International Phonetic Alphabet: A plan". Journal of the International Phonetic Association. 16 (1): 22–29. doi:10.1017/S0025100300003078. Lepsius, R. (1855). Standard Alphabet for Reducing Unwritten Languages and Foreign Graphic Systems to a Uniform Orthography in European Letters. London: Seeleys. MacMahon, Michael K. C. (1986). "The International Phonetic Association: The first 100 years". Journal of the International Phonetic Association. 16 (1): 30–38. doi:10.1017/S002510030000308X. MacMahon, Michael K. C. (1996). "Phonetic Notation". In Daniels, Peter T.; Bright, William (eds.). The World's Writing Systems. Oxford University Press. pp. 821–846. ISBN 0-19-507993-0. MacMahon, Michael K. C. (2010). "The International Phonetic Alphabet". In Malmkjaer, Kirsten (ed.). The Routledge Linguistics Encyclopedia (3rd ed.). Routledge. pp. 269–275. ISBN 978-0-415-42104-1. McClure, J. Derrick (1972). "A suggested revision for the Cardinal Vowel system". Journal of the International Phonetic Association. 2 (1): 20–25. doi:10.1017/S0025100300000402. Nicolaidis, Katerina (2005). "Approval of new IPA sound: the labiodental flap". Journal of the International Phonetic Association. 35 (2): 261. doi:10.1017/S0025100305002227. Passy, Paul (1909). "desizjɔ̃ː dy kɔ̃ːsɛːj" [Décisions du conseil]. Le Maître Phonétique. 24 (5–6): 74–76. JSTOR 44700643. Phonetic Teachers' Association (1887a). "lernərz kornər" [Learners' corner]. The Phonetic Teacher. 2 (13): 5–8. JSTOR 44706347. Phonetic Teachers' Association (1887b). "lernərz kornər" [Learners' corner]. The Phonetic Teacher. 2 (19): 46–48. JSTOR 44706366. Phonetic Teachers' Association (1888a). "aur alfəbits" [Our alphabets]. The Phonetic Teacher. 3 (5): 34–35. JSTOR 44707197. Phonetic Teachers' Association (1888b). "aur rivàizd ælfəbit" [Our revised alphabet]. The Phonetic Teacher. 3 (7–8): 57–60. JSTOR 44701189. Sweet, Henry (1902). A Primer of Phonetics (2nd ed.). Oxford University Press. Trofimov, M. V.; Jones, Daniel (1923). The Pronunciation of Russian. Cambridge University Press. Reprinted in Collins, Beverly; Mees, Inger M., eds. (2003), Daniel Jones: Selected Works, Volume V: European Languages II – Russian, London: Routledge, ISBN 0-415-23341-0. Wells, John C. (1975). "The Association's alphabet". Journal of the International Phonetic Association. 5 (2): 52–58. doi:10.1017/S0025100300001274. Wells, John C. (1976). "The Association's Alphabet". Journal of the International Phonetic Association. 6 (1): 2–3. doi:10.1017/S0025100300001420. Wells, John C. (6 November 2006). "Scenes from IPA history". John Wells’s phonetic blog. Department of Phonetics and Linguistics, University College London. Whitley, M. Stanley (2003). "Rhotic representation: problems and proposals". Journal of the International Phonetic Association. 23 (1): 81–86. doi:10.1017/S0025100303001166. Abel, James W. (1972). "Vowel-R symbolization: An historical development". Speech Monographs. 39 (1): 23–36. doi:10.1080/03637757209375735. Akamatsu, Tsutomu (1992). "A critique of the IPA chart (revised to 1951, 1979 and 1989)" (PDF). Contextos. 10 (19–20): 7–45. Akamatsu, Tsutomu (1996). "A critique of the IPA chart (revised to 1993)" (PDF). Contextos. 14 (27–28): 9–22. Akamatsu, Tsutomu (2003–2004). "A critique of the IPA chart (revised to 1996)" (PDF). Contextos. 21–22 (41–44): 135–149. Koerner, E. F. Konrad (1993). "Historiography of Phonetics: the State of the Art". Journal of the International Phonetic Association. 23 (1): 1–12. doi:10.1017/S0025100300004710. Roach, Peter (1987). "Rethinking phonetic taxonomy". Transactions of the Philological Society. 85 (1): 24–37. doi:10.1111/j.1467-968X.1987.tb00710.x.